Aluminium soda cans are thin, making them easy to cut. They are light too and dent easily. 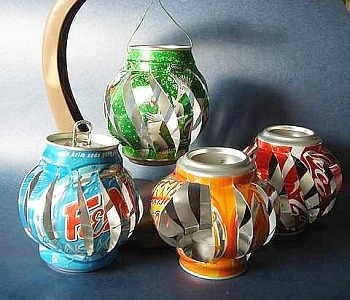 So, how on earth do we cut slits onto the cans to make little lanterns without ruining them? The trick is to fill them with water and pop them into the freezer for a few hours. Six hours is quite enough for the ice to form before working on the cans. I left one can overnight and it burst open in one split! The ice inside the can is the solid “solution” to our creative problem. We can then cut lines, hammer or pierce holes to form patterns and designs on them. I use an ordinary craft cutter for splicing the cans and found the blades sharpened in the process. Be extra careful when making today’s project. 1. Pull the tab to open the can, taking care to leave the tab intact if possible. Empty the drink into a cup. Rinse the can and fill it with tap water. Freeze it for six to eight hours. 2. Lay the frozen can on a piece of folded dish cloth and keep wiping it as you work on it. If the tab was detached when you opened the can, pierce two holes on opposite side of the top of the can. 3. Use the black marker to draw 12 equally spaced dots around the can, 2cm from the top edge. Draw another set of 12 dots corresponding to the top dots on the lower part of the can, also 2cm from the bottom. 4. Lightly mark a cutting line to join a top dot to the bottom dot which is on the right of the one directly beneath it. Draw it in a slight S-curve. Join all the top dots to the bottom ones in the same way. Follow the lines to cut through the can with the cutter. Take care to hold the can firmly with your left hand. 5. Leave the can inside a basin for the ice to melt. Wipe it dry. 6. Light press the top of the can downwards to open the cuts. As you do that, slip the screwdriver inside a slit to press onto the bottom of a strip of the can to shape it outwards. 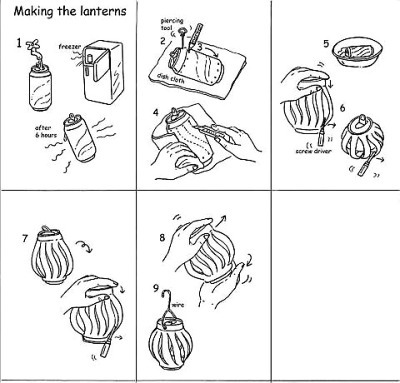 Repeat for all the strips to shape the can into a lantern. 7. Turn the can upside down and press onto the strips in the same way, to obtain an equally-balanced lantern shape. 8. 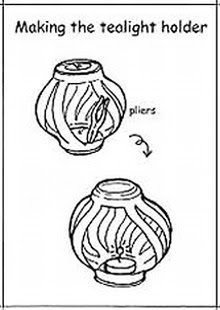 Place the lantern in both hands and twist it slightly, pressing inwards a little. 9. Pass the wire through the set of holes at the top of the lantern. Bring the ends together to form a loop before twisting into a hook for hanging. If the tab is intact, use it to hang the lantern. Cut out two strips from the can to make a wide opening. Use the pliers to bend the cut sharp edges of the top and bottom of the opening inwards. As the top of the can is flat compared to the bottom, use it as the base instead. So turn the can upside down to place the tea light inside it. * Remember, never leave the light unattended.